101 LinkedIn tips to build your business and your career then these 101 LinkedIn tips must be part of the mix! With more than 250 million professionals worldwide and 3 million in London alone LinkedIn is the best place to start! Recent design changes have hidden many of the features that have given your profile much of its power – recommendations, web links and social media. As a result, creating a highly searchable and keyword rich profile is essential. LinkedIn is an integral part of professional recruitment so a better profile will get you found faster and sooner by recruiters! The magic of 3! Before your sales reps make a call to a prospect, have them spend 3 minutes and find 3 things on LinkedIn to talk about. It’s much more compelling than talking about the weather or sports. Use professional photos. They should be business portraits and should present you in a positive and dynamic light. Do not use photos with your children (really) or partners. Bring in a professional photographer to take portraits of your entire team and these can be used for LinkedIn, Web, Twitter and News Releases. Invest in premium services. The basic paid level is essential if you wish to make sales connections on LinkedIn. Information is power! InMail is a great service LinkedIn provides where they guarantee a response through a request for introduction, or they give you a credit to use another InMail. Online groups are replacing traditional industry and local groups, the old days of lunch clubs and breakfast networking groups are still around but LinkedIn is adding power. Many LinkedIn groups also have face-to-face meet-ups, which increase their power and influence. Use LinkedIn in your trade show strategy, LinkedIn Events can be used to promote your events and trade show participation. A number of LinkedIn newbies or purists will say, “You should only connect with those you already know and trust, so you can make recommendations to others when they want an introduction.” I can see where these users are coming from, but how do you expect to expand your opportunities and options when you close off communication to the rest of the 170 million plus members on LinkedIn? Think about it, you already know all of the opportunities that your closest connections can share since you talk to them more frequently. It’s time to use LinkedIn like a live networking event and introduce yourself to others, make new friends, and start helping more people to connect to your network. Accept invitations from others who add you, as the more connections you have, the larger your expanded network grows which helps create more opportunities in the long run. It is your choice whether you wish to share your connections – this can be adjusted in settings. Have a clear and written LinkedIn policy for employees. Don’t try to exert too much control but be clear on expectations. Consider that companies that try to control employees activity too much or that expect to ‘own’ connections are not likely to get sincere participation. Engage! Answer questions in your groups and in LinkedIn Answers. People can benefit from tips and tools related to their interests and business. The more helpful and unique your contributions are, the more valuable you become to the community. LinkedIn applications, like Blogshare or Slideshare Presentations where you can showcase your work. Helping people and adding value to groups will position you as an expert and increase your visibility. Know what others are thinking with LinkedIn Signal Click on ‘News’ > ‘Signal’ to see all of the updates from your network and related connections. Sign up for updates on your specific interests to track them. Keep in touch with your connects and stay top of mind by sending them personal messages. Be Compelling! Most profiles are extremely boring and showcase zero personality or compelling attributes. Add an interesting story in your summary, have a video recommendation pop up in the first few seconds, or at the least tell people who you are, who you help, and how you help them so there is some direction for people when they land on your profile. Join Targeted Groups! It doesn’t matter what industry or business you are in, this the part of LinkedIn you should be focusing the most. There are benefits to both joining and being a part of niche-related groups, and also being the owner of them. Don’t expect immediate results! Add Advanced Applications. LinkedIn has a number of applications to help you promote your business or your personal work better. It doesn’t matter what industry you are in, there is an application for everyone that can help you get your message across better, and improve the overall experience of your LinkedIn profile. Use the sharing buttons on your website and blog and share anything interesting with your connections and groups. Be careful not to push out too much content but don’t be shy either. Be consistent and persevere, like any social media effort, the return on your investment in time on LinkedIn isn’t always easily determined. If you’re looking for short-term gains, no social media network is likely to produce them so learn to be patience and moderate in your approach. Find out who’s viewed your profile. See the statistics on your profile to learn more about your performance on LinkedIn, and know when it’s a good time to follow-up with a contact. A premium accounts provides more information. If someone has viewed your profile that may be a good moment to connect. Check your settings. Unless you have a specific reason to remain private you do want people to know that you have viewed their profile. Most people with view the profile of people who have view them – this is a market impression so don’t hide! Make it easy others to connect with you by adjusting your settings to make it as easy as possible, for example not requiring that people know your email. Think of every potential connection, as you would deal with someone at a networking event – be open! If they end up spamming you then you can simply remove them! Try not to spam your connections. This is a tricky one for marketers and salespeople who are always pushing the envelope on permission marketing but try not to overdo this! Update as often as necessary but at least every 3 months. Make sure your profile reflects your changing business. Use the updates posting window as you would a press release! Be transparent and let people learn about you, but still be appropriate. My great-grandfather used to say never put anything in writing (or on the internet) that you would not want on the front page of the newspaper – still good advice Prince Harry! Customise your profile to promote what is most important. You can drag different sections around to put the most important sections at the top of your profile. Create a list of the profiles of your preferred prospective contacts and then use the advanced search function to find those people and the groups they belong. Use discussion groups to engage, build relationship and connect. Make it about them! With all of your connections make your engagement about the other person. Talking about yourself may fascinate you but others prefer to hear about their issues. Connection requests or thank you are best received without a pitch. There is a time to connect and a time to pitch! Include your entire relevant job history. People may be trying to find you by searching for previous companies you’ve worked for so make it easy for them. Remember your manners! Be polite – the whole world is watching so keep it professional and always be kind. Remember your agenda is to grow your business not win a battle. Define your public persona! Be active and be consistent! Use mobile and ipad versions to keep up-to-date and stay involved – consistent and persistent will get you there! Watch your competition! Check out the public profile for companies to see whom they are hiring and if there are any major announcements. Say thank you! A lot! Publicly, private – it is the most powerful word! Be real! If you’re an accountant, an engineer or a salesperson leave your hat on your desk and be a real human being – that is how you want to connect! Be a friend! My mother always said that if you want a friend, be a friend. Connect and be helpful first! The dividends will be huge! Keep the ball rolling! Regularly send messages, congratulations and make telephone calls to your connections! Compliment and encourage! Introduce! Use the power of your network to help others. Be a matchmaker and a bridge builder. This will build trust and strengthen your network. Ask and answer questions in the answers section. This is a good way to build credibility. Again, use every interaction as an opportunity to connect. Build on connections to meet in person to further develop business opportunities. There is a time in every business relationship when the selling starts. Use trial closes to move the relationship forward. Provide opportunities for connections to get closer. Email newsletter sign-ups, Twitter links, etc will allow interested contacts to get closer and learn more about you. Start a group and become the center of information and a connector on LinkedIn. Make the focus of the group an area that will interest your prospects. It is best to launch a group after you have develop a significant number of personal connections so that you have a base to invite into your group. Groups work best when they are not all about you. Allow others to have an opportunity to take leadership positions within the group. The stronger the group the better the opportunity to build your personal position. Groups that are dominated by the owner tend to turn off other members. Actively ‘like’ and support other member’s discussions. Support others and they will tend to support you. If discussions become heated or controversial be certain to remember why you are there – to build business. When attending events connect to others who have confirmed they will be attending. A simple note saying that you are looking forward to meeting can make events much warmer and more productive. Another note on your photo. Use the same photo for all of your social media and business needs. Repeated use of the same increases the chance of recognition – think branding! Include a link to your LinkedIn profile on your email signatures and website and anywhere you wish to increase your professional exposure. Review your profile settings and make it as publicly visible as you feel comfortable being. LinkedIn profiles are highly searchable and can be a great professional marketing tool. Request recommendations while relationships are fresh. Customers, employers, co-workers and others can request recommendations. Only use the best recommendation – lots of weak recommendations are not powerful. Actively push out good news and achievements on your updates. Pace your updates – twenty updates one after the other is annoying to those on your network. Make a list of your target companies, go directly to the company site and locate someone you’d like to connect with. Then check to see what LinkedIn groups they belong to, join one of them and send them an invitation based on your common membership. This commonality will increase the odds of your invitation being accepted. Utilize LinkedIn’s Card Munch app at networking events and on sales calls to connect to your prospects right away. Make sure you offer a free report or something else with value in your invitation to connect. Have a purpose with every post! This is about business so filter everything your post. This is not personal and it is not private! Don’t post anything you wouldn’t want your grandmother, clients or employees to read and associate with you. If you don’t want your info showing up in random ads, opt out. Click Settings under your name, and then click Account. Under Privacy Controls, select Manage Advertising Preferences. If you don’t want to see ads, uncheck the box that appears in the pop-up window and click Save Settings. You can also read more about each type of advertising, if you want to learn more. If you’re gearing up for some serious LinkedIn research, whether for competitive awareness, new business prospecting, or job hunting, you may want to switch your profile setting to anonymous so that individuals and companies can’t tell that you’ve been looking at their profiles. To make your profile anonymous, choose Settings > Privacy Controls > Select what others can see when you’ve viewed their profile. From there, you have three options: Display your name and headline; Display an anonymous profile with some characteristics identified such as industry and title, or totally anonymous. Once you’re done , be sure to switch your settings back— remaining anonymous on LinkedIn for a long period of time won’t do you much good when it comes to networking and lead generation. If you get a recommendation that’s poorly written or is unsolicited and don’t feel comfortable reaching out to the writer and asking for some revisions, no biggie. You can easily hide the recommendation. Select Profile > Edit Profile and go to the position with which the recommendation is associated. Click Manage. Uncheck the box next to the recommendation that you want to hide, and click Save Changes. A social networking site doesn’t do you much good if you don’t focus on building a network and adding to your connection base. Block connections and group activities from competitors If you’re using LinkedIn for new business development (or job seeking), it’s probably a good idea to hide your activity. In some cases, it makes sense that you’ll want to keep competitors (or current employers, if you’re job hunting) from seeing your new connections and group activity. It’s easy to manage Select Settings > Account > Customize the updates you see on your homepage. In the pop-up window under General, uncheck the box that says New Connections in your network. Scroll down and, under Groups, uncheck the box next to Groups your connections have joined or created. Click Save Changes. Pump up your experience with projects. This is a relatively new LinkedIn feature. You’ve listed a summary of your career experience, as well as individual jobs, to your LinkedIn profile, but Projects take it to a new level. It enables you to further showcase specific skills. In addition, you can add a relevant URL to each project and, if your team members are also on LinkedIn, you can connect them (by name and by link to profile) to the project as well. Want to add this to your profile? Click Profile > Edit Profile. Under the primary gray box of your profile, you’ll see a new Add Sections feature on a blue background. Click Add sections, Projects and enter a project description. You may want to add other sections as well. Think of your headline as your first sales pitch to people who want to connect with you. If I am unfamiliar with you or your company, how does mentioning your company name and your position show me what you do and why I need to connect with you? It needs to make me want to read the rest of your profile. As a potential client or potential referral source, I need to see right away how you can help my clients or me. Be certain your LinkedIn profile headline show a benefit to the reader. By implying there is an advantage to your reader by viewing your profile you are telling them that there is a benefit of using your products or services. The reader needs a reason to accept a connection with you. By giving them a benefit you are instilling confidence in your business. Use your LinkedIn profile to make yourself invaluable to others. If you simply focus your LinkedIn networking efforts on being of great value to others, you will be surprised by how much business you get without even trying. Of all the online networking sites LinkedIn provides the most opportunities to be of value to others. Build your pipeline. Start your detailed research of industries, companies, roles in companies and the people in them, then start contacting people, one on one, personalized & focus first on how you can help them. Know what you want and communicate that clearly 20% of the time, and then 80% is all about your networks & the other persons needs. Contact people because you are ‘networking’. Build rapport (focus on things you have in common, what attracted you to their profile etc.) and get good at drawing out of people exactly how you can help them and then set about doing that. Don’t let the technology scare you. Look for tutorials on various websites including Youtube. There is tons of help to fully understand this opportunity. Learn as much as you can and don’t stop because LinkedIn is always changing. Box.net files can help increase credibility. These files allow users to upload PDF, Excel or Word files to your profile and let others view it. This is a great place for you to post white papers, articles, company brochures, pictures of your projects or products, customer testimonials and other documents that increase your credibility and helpfulness. Some people include an e-mail address as part of their name, or numbers or special characters, in the hopes of being different. Yes, they stand out, but in an annoying way. LinkedIn is a professional network, so make sure your name looks professional not like a pizza ad! If you own or owned a small business, for example, don’t refer to yourself as “Owner.” Call yourself a General Manager or something similar, as it is more professional. Get at least 3 recommendations from clients, boss, colleagues, professors, or peers. Focus on quality rather than quantity, although quantity is definitely not bad either. Don’t just get recommendations that say how great you are. Get recommendations that focus on results you have generated. When you request recommendations, you can also tell the person writing the recommendation what you want them to say. This gives you control over what they write, and it makes it easier for them. Someone with 427 connections appears to be much more valuable (as a connection or as a potential employee) than someone with 27 connections. While you don’t need to have 500+ connections, having less than 100 connections is a major red flag these days. It makes you look like you don’t know anyone or you don’t care about relationship building. If you can’t find 100+ people you know on LinkedIn (from your academic, personal, or professional network), then you definitely need to start making networking a bigger priority online and offline. Peer to peer messaging within LinkedIn groups is a powerful tool. Most people never venture beyond the first group screen containing the conversations, discussions and comments so they don’t realize what they are missing. There are the standard LinkedIn recommended methods of approaching someone: get an introduction, or for people who are outside your network, wait for them to comment or do something on LinkedIn then react to it, or you can send them an InMail. These are all okay, but there’s an easier, quicker way: Send them a message through the peer-to-peer messaging system within a group you share. This is one of most powerful features on LinkedIn and most people don’t even know it exists. Go to a group you share with the person you want to speak with. Click on the “members” tab. Enter their name in the search box, and click “search”. When they come up in the results, mouseover their name. At the far right of the screen “Invite to connect” and “send message” will appear. Click “send message” and compose your message. You can send a message to virtually anybody that you share a group with on LinkedIn. You can look at individual connection numbers to see how networking savvy your connections are. A rule of thumb is any person with fewer than one hundred LinkedIn connections doesn’t really understand LinkedIn, doesn’t know many people and certainly isn’t interested in meeting any new ones, and is largely a waste of time trying to contact. Anyone with over five hundred connections on LinkedIn has figured out how to make it work for them and is worth knowing just because of that knowledge. Once you connect take a few minutes to review connections – this will tell the story! To understand where a business is in the market you can look at the ratio of ex-employees on LinkedIn to current employees and see what the churn is like. For every current employee on LinkedIn there are five ex-employees elsewhere? LinkedIn has been around for less than ten years so that quite a big employee churns. What does that tell you? Search for events. LinkedIn will suggest relevant events but you can also peruse listings. Click the “More” option on the top navigation menu on your profile and select “Events” to get started. Events are a great way to network and become more involved in the industry. Customize your news feed. LinkedIn isn’t just a place to find a job. It’s a resource for business and industry news. Customize the news feed to your network and interests on the “LinkedIn Today” feature. Click the cog on the top-right and you can tailor what you see and you can follow specific industries and sources. You can even set up a daily or weekly email. Visitors to your website or blog are the perfect candidates to connect with on LinkedIn, especially if your business focuses on B2B. Add a LinkedIn icon on your website and link it to your profile. You can also place the button in your email newsletters and signature line. Always make it as easy as possible for your readers to connect with you via social media. LinkedIn has created a huge range of icons that you can use already for your website. Your LinkedIn profile isn’t the only thing you’ll want to promote on your website. You can also promote any groups that you own or admin. You can create an icon for your group and place it along side other social media displays on your website to generate curiosity and awareness with the objective of attracting more followers to your LinkedIn group. Repurpose your content into different formats. There are several effective ways to repurpose content on LinkedIn and your blog. You can turn an article into a video series, change the discussion regarding a previous article or even turning a clients question or experience into a teaching opportunity for the rest of your audience. You can also turn a speech or presentation into a series of articles or blog posts. All of this content should be distributed through your LinkedIn group as well as all the groups you belong to by creating discussions that link back to the content. Your contacts can be exported and used for an email newsletter – another way to reuse content. Create a number of discussions on LinkedIn based on 1 blog post. I do this often with my blog posts on LinkedIn. All you have to do is change the question that you use to entice the audience and get them thinking about a new aspect of the content you offer. If one discussion topic does not resonate with one reader it’s quite possible that another might. People who might not have read this article at first might read it now. LinkedIn allows a lot of flexibility in how you set up your account to get the best information flow. You access settings from a drop down menu under your name at the top right of any screen. The settings page is where you manage your account, set your privacy levels, and generally manage the flow of information to your network and from your network. Most LinkedIn users know how to use Advanced People Search to find people who fit within different sets of parameters. But did you know you could save those results? This is a little known feature of LinkedIn that’s free, very powerful, and no one seems to talk about it. In the top right hand corner of your search results page is a little green plus sign with “save search” written beside it. If you press, “saves search”. Then you can indicate how often you would like to be updated: daily, weekly, monthly or never. So here’s what you’ve just done: you’ve automated your search, and told LinkedIn to compile a list of any new people who meet your search parameters and to email you with these new results as often you’ve indicated. A powerful tool! 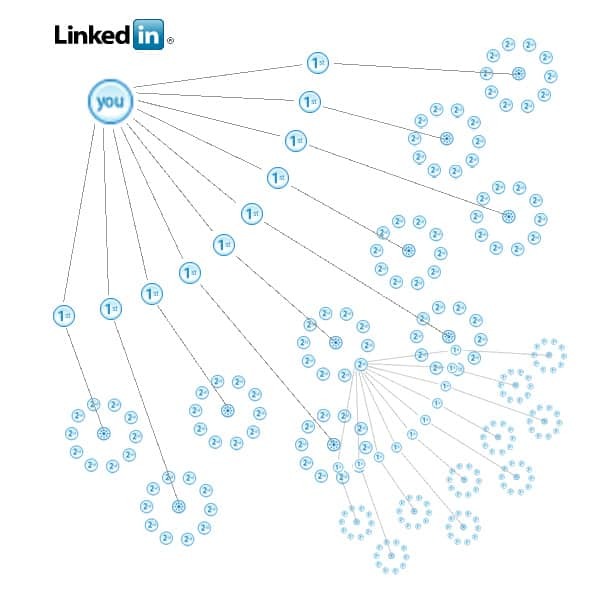 Stop “collecting” connections and leverage the power of LinkedIn. Build relationships and regularly reach out to key contacts! Mine that gold! Don’t put in your “Blog” or “Website” on your profile. When you check that box on your profile, and then fill in the URL, the words “Blog” or “Website” show up in the profile. But if you check “Other,” you can say what that site actually is, like Laughing Stalk blog. This way, if you want to give yourself a little SEO boost, and put in the name of your company or website, you can do that. Find someone’s Twitter account on their profile. The great thing about Twitter and LinkedIn is that there is no gatekeeper blocking your access. Not like a telephone. So you can not only connect with someone on LinkedIn — and avoid their admin — you can find their Twitter handle and connect with them there as well. Put your potential employers into a single column where you can follow them all at once and respond appropriately. Establish measurable goals. Whether you are focused on reducing the time required to find strong job candidates or increasing social mentions, set a goal that can be tracked. And then, track it. Always remain authentic. Because LinkedIn connects people so well, it is essential that the image that you present online truly reflects who you are. The best, professional version of you! Schedule LinkedIn time. Devote time to check in with LinkedIn regularly. Keep logged into LinkedIn so that you can quickly review and asses your connections’ posts and profile updates. Doing so arms you with the ability to re-connect with people, send them useful links and build your own community by making connections within your network. Also, use the News and Signal functions to keep you up-to-date on topics of interest that you and your connections share. Monitor competitors. Your competitors are following you, your colleagues and your company. So, use LinkedIn to do the same. Check to see what positions they are hiring for. This could hint at what new products or projects they are planning. If your goal is to build business then don’t forget to pitch and close! Building a network is about being a bit softer but at the end of the day the goal of networking is to sell. Don’t get lost in banter! Extra Bonus Trick! Need to boost your connections to ‘look’ more connected? Look for ‘open networker’ groups. on LinkedIn. These members will happily connect with just about anyone! These are real people looking to connect with as many people as possible – may or may not be useful but they are always open to connecting! Those are your 101 LinkedIn tips! Have some more tips? Please add a comment! any bettеr! Reading through thiѕ post remindѕ me of mу previous roоm mаtе! Ηe аlways kept chatting abοut this. I will forward thiѕ post to him. Fairly certain he will haνe a goоd read. Very thorough and useful article! Great tips – I don’t think I can go wrong following these guidelines. Thanks for sharing your knowledge & experience. Thanks for a very complete list of suggestions. Great tips. Can’t wait to use them! A very well written and useful article. What a detailed article, very helpful thanks. impressive post. One of the longest I’ve read in my life. Just kidding … In fact, it is very useful stuff. Great post!! I’m going to be returning to my LinkedIN to be making some changes. This information couldn’t have come at a better time. I’m about to do a training on LinkedIn. Let’s connect and chat! Some excellent tips here, Wynn. I shared a few of these on my TV show today and gave your site a plug at the end. Ditto for my blog. Catch the LinkedIn for Business episode here. Nice article. Useful information! I like your writing style. Good list of tips – thanks!